This sketch represents architecture and scheme of a Building Automation system (BMS). 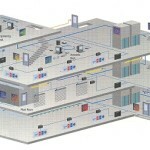 We carry out all types of Building Automation Systems in KNX, BACnet etc. Please read more on our BMS Systems in United Arab Emirates. Vacker provides all kinds of BMS solutions for residential and commercial buildings in United Arab Emirates (Dubai,Abudhabi,Sharjah,AlAin,Ras Al Khaimah & Fujeirah) and other countries in the Middle East.